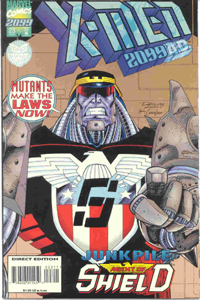 After Doom's conquest of the United States of America, all 2099 titles were affected. Some had minor changes, some had major. Nevertheless they all felt the hand of Doom in one way or another. 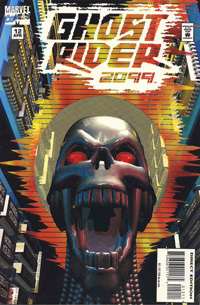 Below is a list of Doom 2099's appearances in other 2099 titles during the 2099 Under Doom period. 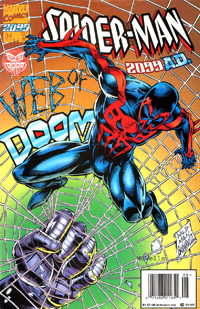 All of them take place after the pivotal events of Doom 2099 #29. In some issues Doom makes nothing but a cameo appearance. 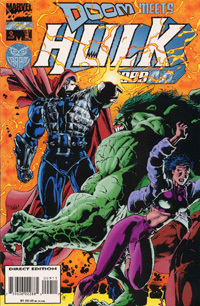 Summaries will reflect only Doom's role in the issue. Issues are grouped by series, but the series themselves are listed in no particular order. With Tyler Stone promoted to Doom's corporate liaison, Miguel O'Hara is offered his old job as VP of Alchemax's R&D division. Meanwhile, Doom offers Spider-Man a post as his Minister of Supernormal Affairs. Doom informs a grateful Dana that Tyler Stone is alive and been transferred to facilities in New York. He later informs Miguel of Stone's shooting and the fact that Dana was living with him. In the aftermath of Doom's take over of Washington, Doom gives his inaugural address. 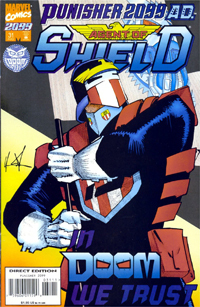 In it, he announces the creation of SHIELD, a national police force devised to keep order in the United States of America. 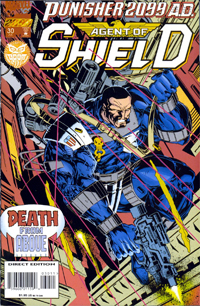 Doom personally has The Public Eye disbanded and enlists Jake Gallows AKA The Punisher as his Minister of Punishment and head of SHIELD. 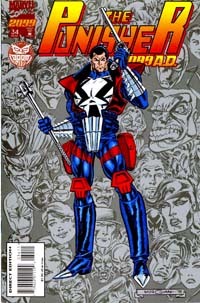 Gallows also heads his own elite squad, the Punishment Police with his alter ego as the Punisher public knowledge. Doom observes Jake Gallow's pursuit of his former ally, Matt Axel. He views Gallows as he diverts manpower to the pursuit from police forces that are supposed to be fighting back a riot. He also sees how Gallows doesn't want his activities to be recorded by the Internal Investigation officer, Saffron, that he assigned to him. As Jake and the Punishment Police pursue Matt, a building with a partially seen logo reads "Tyrell." Likely a nod to the Tyrell Corporation from the film Blade Runner. 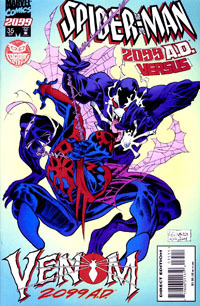 The film is of course a major influence on the look and feel of the 2099 universe. Saffron reports that opinion polls all show that the population is enraged by Gallows' actions. Doom decides that Jake has had his chance as Director of SHIELD and orders Saffron arrange for his demise. His orders are for Gallows' to be discredited and then eliminated. Just prior to his invasion, Doom enters the Ghostworks and requests an audience in order to discuss matters of mutual interest. 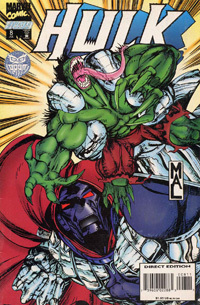 Doom takes control of Kellerman by implanting a small device into his brain. 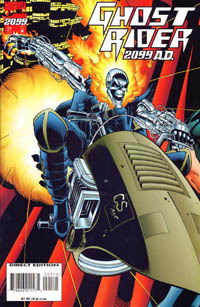 He instructs Kellerman to cease his campaign against Ghost Rider because he has plans of his own for him. Doom fires the head of Central Security Systems and hires Willis Adams to head pro-Ghost Rider propaganda. After SHIELD agents bring Ghost Rider to him, he appoints him Federal Marshal of Transverse City. 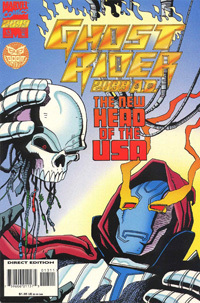 Ghost Rider turns the job down, but Doom reveals that thanks to his agreement with his Ghostworks masters, he has no choice in the matter. His masters have given him access to codes which give him complete control. 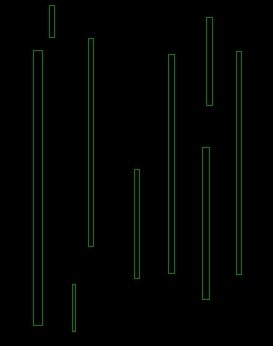 Using the codes, Doom reprograms him to accept the appointment. Ghost Rider then accepts the job enthusiastically. Ghost Rider is only answerable to Doom and Jake Gallows, Minister of Punishment. 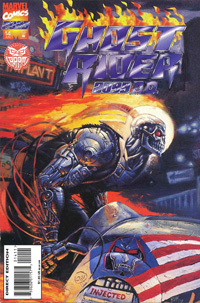 After Doom is deposed, Ghost Rider regains the memory of being reprogrammed to accept the job as Federal Marshal. Doom appears as a holo-broadcast announcing that the USA is his. Doom comes to Las Vegas to order Jordan Boone (aka Halloween Jack) to turn off and hand over his Virtual Unreality Projector. However the device cannot be turned off. Doom then commands a phalanx of his EMPs to surround Las Vegas and create a barrier. Without the barrier, the VU effect would spread across the whole world. the EMPs effectively close off Las Vegas to the rest of the World. 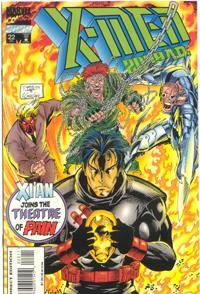 Morphine Somers accompanies Doom as he tries to recruit the X-Men to his side. Unfortunately they are not be found. Morphine suggests they reassemble Junkpile. 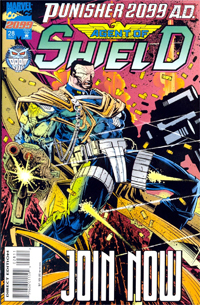 Doom and Morphine Somers appoint Junkpile as an agent of SHIELD. His mission is to eliminate the Red Market which deals in human/mutant slavery. 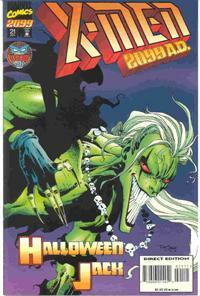 Junkpile gets a similar deal as Ghost Rider, he only reports to Doom and Morphine Somers. Doom and Morphine finally catch up to the X-Men after they defeat the Theatre of Pain and free the poor souls captured in Floodgate Slaughterhouse. Doom informs them that he has had a city built in the West for mutants and any other refugees from the Red Market. Doom wants the X-Men to be the guardians of the city. Title - Metal Guys make me Nervous! Doom, early in his administration is distributing his EMPs [Environmental Maintenance Platforms] all over the country. Only one place refuses because they find them suspect, California. 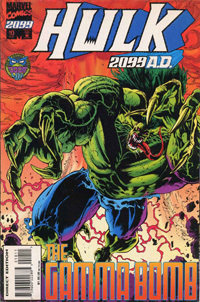 The Hulk destroys one EMP believing that it is a weapon or spy platform while a mysterious character takes control of the others. Far away Doom tries to regain control of his platforms with no success. He then decides that someone has taken control of them and must go and take care of things personally. In the meantime all of LA believes that Doom is trying to kill them. Doom's armed forces chase off Draco, defeating his plans to take over Lotusland for the moment. Doom then appears via hologram and asks to collect the gamma powered mind influencing device which was promised to him in exchange for government protection and autonomy to broadcast whatever they like. 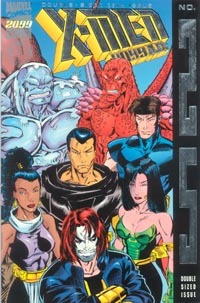 Doom chooses to provide the resources to fully develop Lotusland's Gamma powered mind control technology. Hulk objects to this and tries to fight off Doom's army, but Zamora, Lotusland's leader agrees to Doom's terms. 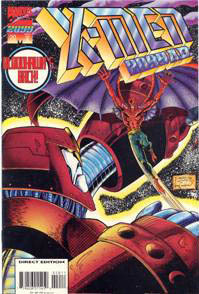 Doom hurries Doctor Apolonio to complete the "Mind-Shaper", a gamma powered device which can influence minds in mass. Doom wants the device in order to solidify his position as president. 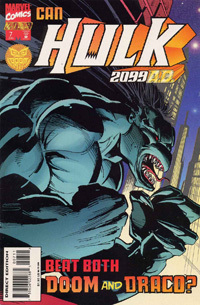 The device is stolen and his hologram accompanies his troops as they follow Hulk and Quirk. The two eventually end up facing the Adonai and the Locusts who have armed a Gamma bomb underneath the city. An earthquake erupts that affects the whole state and the bomb detonates. When the ion induction field that attracts pollution to Hellrock is sabotaged, Doom must step in before the resulting explosion contaminates the planet's atmosphere. Doom's solution is to encase Hellrock in liquid adamantium. Once encased, the island is to be launched into space. 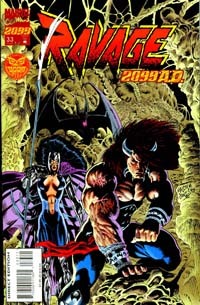 When Ravage learns of his plan, he attempts to kill Doom, but he fails. The island is drenched and finally lifted away. Before drowning in adamantium, Ravage swears revenge on Doom.